Nashville Major League Soccer (“Nashville MLS”) hasn’t been here long but they’re already doing amazing things for the city of Nashville. Not only are they turning Nashville into a soccer town (move over hockey), but they’re also bettering our cherished communities. A new state of the art mini soccer field (“mini-pitch”) is being built in North Nashville, and we have Nashville MLS to thank for it! Mini-pitches are small, customized areas that are perfectly suited for organized soccer programs and pick-up games. They provide a safe quality surface for kids to play on, and when built in communities where families are new to the game of soccer, these mini-pitches provide an opportunity to expose the game of soccer to a whole new generation. The new MLS Nashville mini-pitch will be located at the McGruder Family Resource Center in North Nashville (2013 25th Ave N., Nashville, TN 37208). This is great news for the North Nashville community. 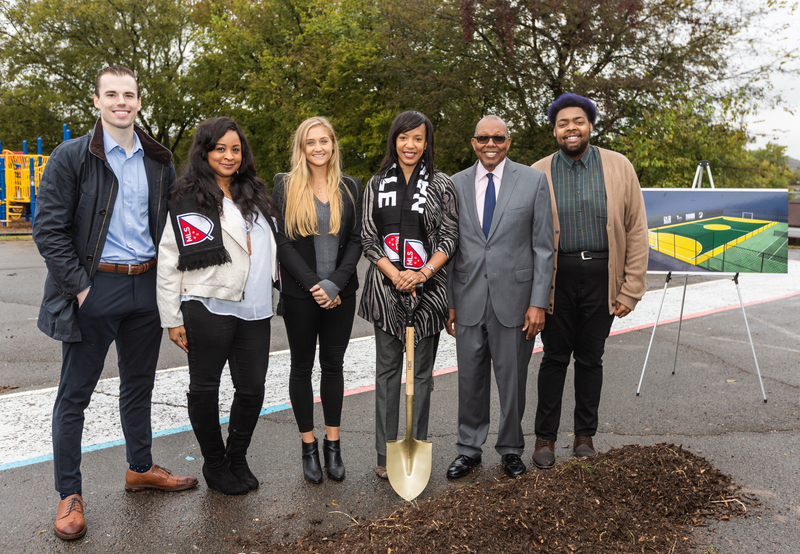 Nashville MLS partnered with the U.S. Soccer Foundation and United Way of Metropolitan Nashville in order to make this happen. The project also involves support from Metropolitan Nashville Public Schools and Catholic Charities. Nashville MLS will also provide youth programing, training, and resources for the new mini-pitch. The families of North Nashville will benefit from this mini-pitch for YEARS to come. So when will this new mini-pitch be up and running? Soon – construction is already under way! The duGard Communications team worked tirelessly in order to organize a successful ceremonial groundbreaking. Many distinguished guests were in attendance – including District 21 Council Member Ed Kindall, At Large Council Member Sharon Hurt, Nashville MLS CEO Ian Ayre, Nashville MLS Owner John Ingram, MLS2Nashville Committee Co-Founder Will Alexander, Nashville Soccer Club owners Marcus Whitney and Chris Redhage, and United Way CCIO Erica Mitchell. 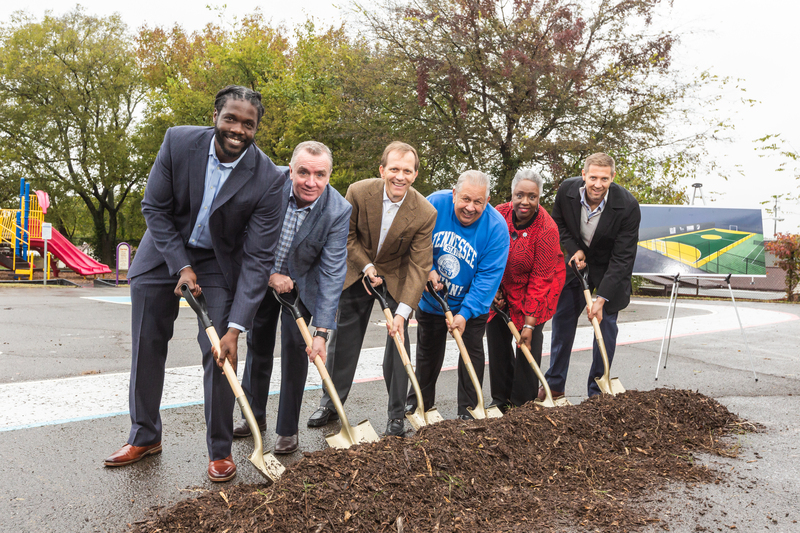 The groundbreaking was a great opportunity for Nashville MLS to launch its commitment to the community. We owe a special shout-out to our first-class vendors, Gamma Blast Studios, Chef Batts, and Photographer Nathan Morgan. Also, a huge thank you goes to the McGruder Family Resource Center Director, Alisha Haddock. Soccer’s popularity has skyrocketed in the United States – especially in recent years. Unfortunately, the sport has yet to take hold in African American communities. Nashville MLS hopes to reverse that trend. The state of the art mini-pitch will give kids an opportunity to play one of the world’s most exciting and popular games. It’ll also encourage kids to stay active, learn teamwork, and develop leadership skills. This inaugural mini-pitch is a part of a broader community-focused initiative for Nashville MLS. As the new team on the block, Nashville MLS is taking a grassroots approach to developing its fan base. By fostering soccer in areas where the sport has traditionally been absent, Nashville MLS hopes to inspire a new generation of soccer players and fans. With this new mini-pitch, Nashville MLS will be one step closer to making soccer accessible to all! Once construction on the mini-pitch is complete, Nashville MLS will host a fun-filled community day. Details for this event will be released shortly – stay tuned! duGard Communications is proud to work alongside Nashville MLS as they make the amazing sport of soccer accessible to all Nashvillians. Here at duGard Communications, we pride ourselves on working with clients whose businesses positively impact our community. You have the dream. We have the strategy. Let’s make it a reality.